The LPK25 laptop performance keyboard is a USB-MIDI controller for musicians, producers, DJs and other music creators. It measures less than 13 inches across and weighs less than a pound to easily fit into a laptop case, backpack or messenger bag for extreme portability. Keyboard players who want to work with software on their computer will find that the LPK25 gives their laptop the keys they need to express themselves anywhere. 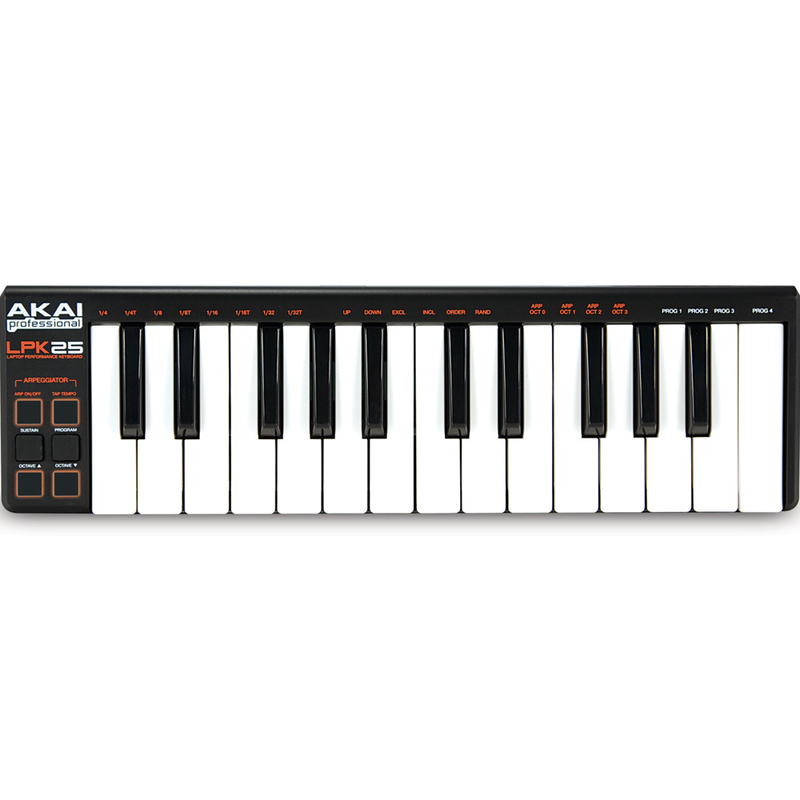 The LPK25 is a scaled-down relative to the MPK series of keyboard performance controllers. The diminutive keyboard is made up of 25 miniature, velocity-sensitive keyboard keys with synth action. The LPK25 contains an arpeggiator, which steps through chords automatically, assisting musicians with creating quick melodic ideas. Sustain, octave up and down and tap tempo controls round out the LPK25's easy-to-learn layout. The LPK25 works plug and play with Mac and PC and requires no software driver installation or wall power for operation. It has four memory banks for programming and recalling settings appropriate to different software programs you use. Create melodic and harmonic riffs in seconds, anywhere, with the LPK25. Ignite music creation software from AIR works seamlessly with LPK25, giving you the fastest way to capture ideas and make music. ItÍs a refreshingly different approach, a simple and seamless creative partner that empowers your ideas and brings them to life. Say goodbye to the rigid and complicated methods of the past. Say hello to a fresh new way to create. Ignite includes over 275 instruments, many of which are taken from our renowned instrument collections - including Strike, Structure, and Velvet. All sounds have been optimized to load quickly, and the editing controls are automatically mapped to your connected LPK25 keyboard. These extraordinary sounds include keyboards, drums, percussion, basses, guitars, synths, strings, brass, and woodwinds.